Work schedules often make it difficult to take pets to the vet. We offer a personalised house call service, at the time that best suits you, 365 days a year, including emergency visits(1). Nowadays, pets are considered members of the family and, as such, questions can arise dubregarding their nutrition, appearance or state of health. In order to answer these simple, queries, we provide a 24-hour hotline, via phone or email. We want to instil a preventative approach in the treatment of illnesses. For this reason, we believe in the importance of establishing trust and effective communication between owner and vet. The health and wellbeing of your pet is of the utmost importance to us. For this reason, CasaVet24 is made up of specialists who have many years of experience in general veterinary practice for pets. As vets, we are delighted to be part of your animal's life and to help to you to understand what could be behind certain behavioural issues, how to treat or alleviate illnesses, and, above all, how to prevent them. (1) House calls will be made as long as the animal's health allows. If more critical care is required, surgery or admission to a clinic can be arranged with our associated centres (we will monitor your pet's situation and keep you fully informed). CASAVET24'S TEAM CONSISTS OF VETERINARY SURGEON LÍDIA LINARES LANGA AND VETERINARY NURSE PAULA MORENO VENTURA. Lídia Linares Langa holds a degree in veterinary science from the Universidad Autónoma de Barcelona. She has been working and carrying out internships in small animal veterinary medicine since 2007, during which time she has gained a wide experience in internal medicine and in canine and feline surgery. 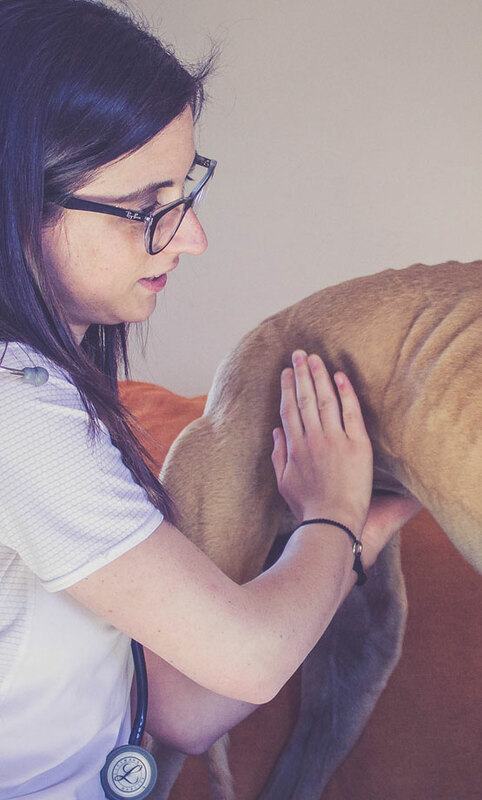 Lídia’s passion for animals, together with a lack of family-orientated vets in the province of Girona led her to incorporate CasaVet24, at-home veterinary practice, back in 2010. Lídia’s curiosity and desire to learn means that she often attends courses on conventional and alternative veterinary medicine, in order to be able to treat your pet with the most suitable tools and techniques. Paula has always been an active volunteer and champion of animal rights. She is currently a member of the Board of Directors of the Galgo Leku Association (association for the rescue and adoption of greyhounds), and is an expert in horses. Paula’s love for animals led her to study veterinary nursing one year ago. Paula currently combines her work at CasaVet24 with her role at the La Riera project, a centre for animal assisted therapy with horses in Sant Quirze de Besora. Our philosophy is that the health of your pet is in good hands and that you have access to professional advice 24-hours a day (by telephone or in person). CASAVET24 HAS A VEHICLE THAT IS FULLY ADAPTED TO BE ABLE TO TAKE YOUR DOGOR CAT TO OUR ASSOCIATED CLINIC, SHOULD THEY NEED SURGERY TO BE TAKEN IN. IF YOU NEED ANY TYPE OF MEDICINE/FLEA DROPS/PILLS, WE WILL BRING THEM TO YOUR HOME.